Adventures in the Endless Pursuit of Entertainment: What was the play that changed your life? What was the play that changed your life? THE AMERICAN THEATRE WING PRESENTS: THE PLAY THAT CHANGED MY LIFE, America's Foremost Playwrights on the Plays That Influenced Them. 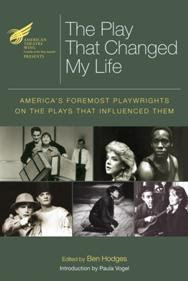 Conceived by the Executive Director of the Wing, Howard Sherman, edited by Ben Hodges (Theatre World) and published by Applause Theatre & Cinema Books, The Play That Changed My Life features an introduction by Paula Vogel and contributions from nineteen of America’s most distinguished playwrights on the plays that transformed their lives. The book is available via the Applause Theatre & Cinema Books website or Amazon, among other places. In connection with the release, the Wing is offering a competition wherein you may share your own story of a play that inspired you. The contest entry period began yesterday , Monday, November 2nd and closes on Sunday, November 29th. To enter, visit http://americantheatrewing.org/contest. The final expert panel judging the contest includes ATW Board of Directors Chairman and President of the Rodgers & Hammerstein Organization, Ted Chapin; Applause Books’ Editorial Director Carol Flannery; award-winning playwright David Henry Hwang; and former Time Magazine arts editor and Broadway and Me blogger, Janice Simpson. Additional prizes will be given based on voting by the general public, which will continue through December 11. What was the play that changed your life? I would have to say, Arsenic and Old Lace. My friend Jamie and I, 8th graders at the time, went to see the Kermit High School production. I don't remember who played Abby and Martha, but I remember them being absolutely hysterical. I thought they were the most wonderful creatures I'd ever seen (I was 12 at the time!) and I remember feeling amazed at what they were doing. They inspired Jamie and me to come up with our own version - our old ladies were Maud and Tressie and we still refer to them to this day. I won't tell you which of is Maud or Tressie though. The best thing was that it inspired me to seek out more live theatre experiences, and to even get involved in plays as crew and actress when I was in high school . HARRIET WALTER - I suppose the one, it sounds kind of silly but I guess it was The Sound of Music when I was about ten. I saw that and I just fell in love with the whole atmosphere. I hadn’t been to that many theatre shows. I’d usually gone to films. I suppose a kid is always make-believing, and there’s something about actors, they keep that bit of them that says, “This could be me. In another situation, if I’d had another life, this could be me.” And it’s their way of expressing themselves and expressing their aspirations. Where a writer will write it down, we do it through another character, we express ourselves through another character. It made an instant connection with me when I saw other people being transported into another world but still being themselves. That’s the kind of magic that instantly translated to me and I’d take home the LP and sing all the songs and all that stuff. I guess that was when I first thought, that’s what I want to do. JEANINE TESORI - I was an intern at Playwrights Horizons in 1983 when I just graduated from college, and watching them put together Sunday in the Park. When they just did the first act and then they did the second act only three or four performances and being outside of it and watching the process, that’s when I really thought, That’s something I want to be a part of. And I just have this unbelievable memory of Bernadette Peters for the first time in that hat, waiting in the hall. The old Playwrights was kind of low rent and really a wonderful place. But I have such a vivid memory of watching that piece come together. And my job was to go – Steve Sondheim doesn’t know this – I was the messenger who would bring his sheet music to rehearsal. And I never once looked inside. I would get on that bus I was thinking “Look inside! Look inside!” And I never did ‘cause I was afraid. I think of a play as a non-musical, so the first play I ever remember reading for some unknown reason was The Affect of Gamma Rays on Man-in-the-Moon Marigolds. I was probably 12, though I can't remember anything about it now so it probably didn't change my life. It was fabulous, she wore a black vinyl robe lined with blood red ostrich feathers. In the musical department, without a doubt, Hair changed my life. I always wanted to play Claude in the version which I produce, direct, design and star in. This is an interesting question because for the longest time, I adamantly hated musicals and plays, but when I was twelve I saw the film version of "The Sound of Music," and I was mesmerized and captivated by the idea that the songs could propel the story so well. This probably had some influence on my novice's opinion that Julie Andrews' was the only singing voice I ever wanted to hear again. As for a live theatre experience, my favorite production that I have seen thus far would have to be my local community theatre's production of Sondheim's "Into the Woods." The set was beyond anything I could have previously conceived, and the caliber of the performers within the cast was excellent. When I heard the original cast recording, my first inclination was one of distase because nothing seemed to connect in the way that I had thought music to work, but I continued to listen to it until one day I heard all of the nuances and how they resolved back to an original melody. The lyrics, of which I have yet to say anything, were incredibly expressive, for they seemed to convey an exact emotion or idea with words intellectuals might employ instead of the usual vocabulary one encounters in songs. Finally, thank you for your inclusion of the essay contest and the memories of the famed actress and equally talented composer who have realized their respective callings on Broadway.